As we head into summer and the season of family reunions and gatherings, many of you may be asked to photograph large groups. I come from a HUGE family where taking photos of our gang in never a simple task! Over the years I have been the designated photographer for our family reunions. I just returned from our reunion in Southern Utah and wanted to share some things I learned! 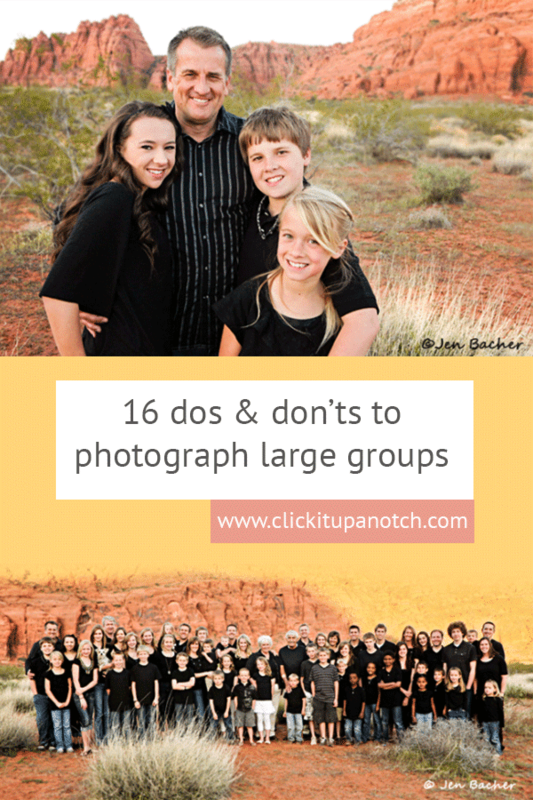 Here’s some quick do’s and don’ts to photograph large groups. This is especially important if you plan to be in the group shot. 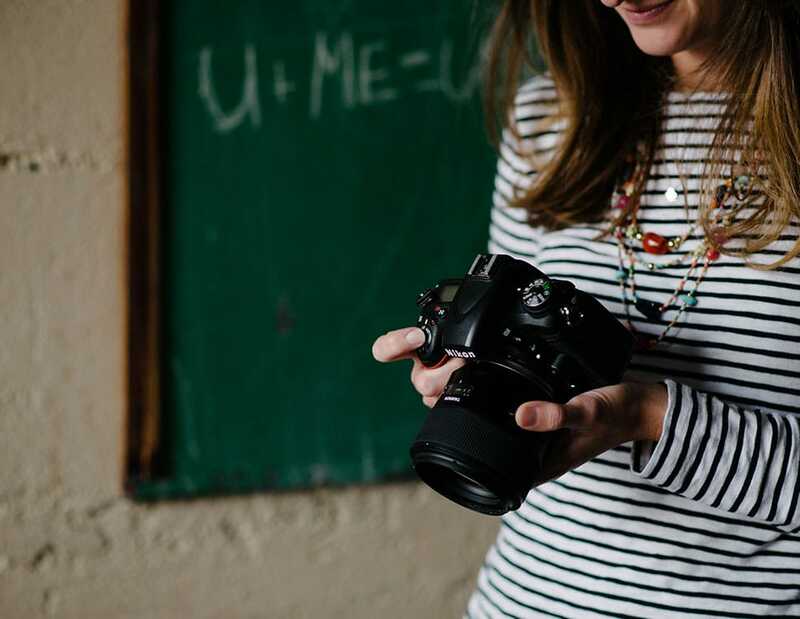 A remote is much easier than using your self-timer on your camera because you can take multiple images (set your camera to continuous shooting mode) one after another, rather than running back and forth and trying to time it just right. A tripod also gives everyone a central place to look. Do use a wide-angle lens. This will make it easier to fit everyone in the shot without having to place your tripod too far away. The closer you can get to the group, the more detail you will have in faces. Do scope out a location ahead of time and bring props like chairs or stools for level changes. Choose a location that will not distract from the people in the photo. There’s already a lot going on with that many faces in the photo. A vast open landscape like a field or a meadow with no houses or buildings in the background is great. For weddings and events look for an area with the fewest distractions and the most even lighting. 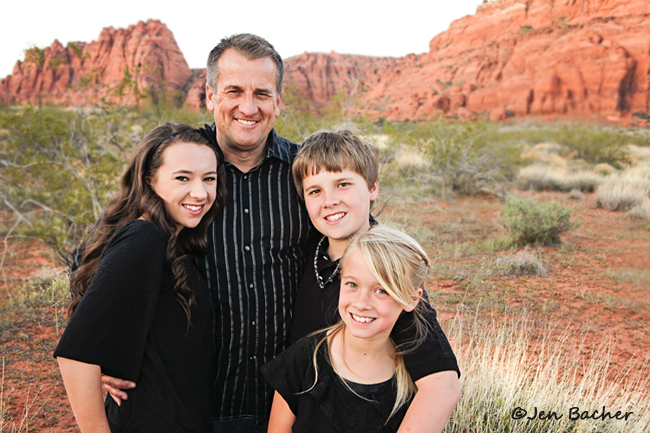 When choosing your location, consider what your lighting will be like during the time you will photograph the large group. For our family shot the sun had just set behind the mountain in front of us, which left us with nice open shade and indirect light as we faced the setting sun. Sometimes it’s also great to place the group in their context, like a sports team on the field, hikers in the mountains, or in our case, the red mountains of Southern Utah symbolized home to us all, since that is where most of my family was raised. Do shoot in the evening and in the shade. This will prevent your group from squinting into the sun. You can avoid those crazy shadows under the eyes and nose by not shooting when the sun is overhead. Evening sun just before sunset is soft and warm and much more flattering. If you have no control over time of day, seek open shade. If it’s getting late or if the sun is behind your group, use a flash. Do set your aperture at f8 or higher. 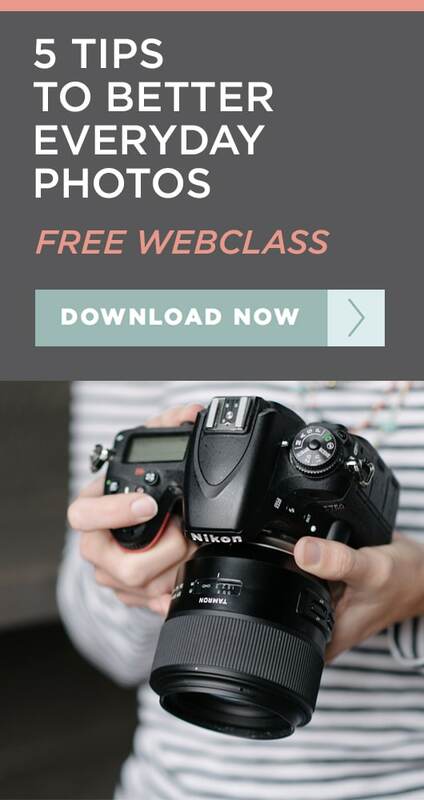 You want to get everyone’s faces in focus. 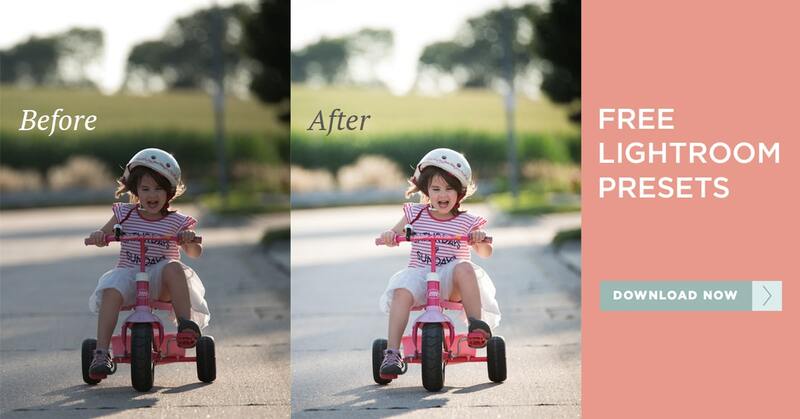 You can swap heads in Photoshop if you need to, or simply to have more images to choose from. When you photograph large groups you most definitely will have some people looking off, blinking, looking at each other, or kids wiggling/making silly faces. It’s nice to have a variety of shots to choose from to find the best head or set of non-wandering eyes to use for the final image. Do have everyone wear solid colors. This will help make sure the attention is drawn to the faces, not the clothing. Tell your group to stay away from big logos and bold stripes as well. Do make sure every head is showing. Tell them, “If you can’t see me, I can’t see you!” And make sure complete heads are showing, not just eyes. Do group people according to families and/or couples. Make sure everyone is standing near his or her family members. This makes it easier for Grandma to show off her posterity in family groupings, rather than trying to find who belongs to whom. And if the event is centered around one or two people, put them in the center of the group. I put my parents in the center, since this was a shot of their posterity! Do remember to shoot some close ups too! Mix it up and do some fun, huggy type close ups along with your longer distance shots if you are shooting individual families or smaller groupings. Do not take a long time posing everyone, and be cheerful! You will lose their attention and cooperation if you are flustered and take too long. 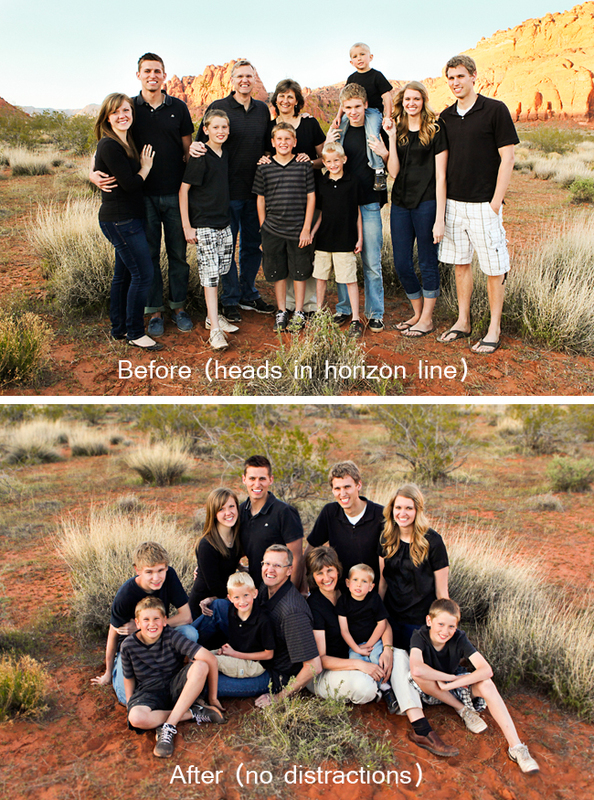 Dads and kids generally don’t like family pictures (mine don’t anyways!) Keep them focused by being fast with the whole process. You can do this by pre-planning posing for the amount of people you are shooting. Don’t be afraid to take charge, communicate what you want, but remain relaxed. If you are relaxed and having fun, your group will be as well! Do not shoot heads in the horizon line. Hard lesson learned with my family this year. I did two of my sibling’s families this way before I realized it was harder to see their faces with the busy mountains going through their heads! Either shoot from below your group and put their heads in the sky where it’s a solid color, or shoot from above by standing on something or placing them in a sitting pose while you shoot down at them. Or change their position completely so their heads have a non-distracting background behind them. Do not let another person with a camera shoot over your shoulder. Your subjects won’t know which camera to look at, which will result in wandering eyes in your photos! If someone wants to help make kids smile, have them stand above you or right next to you so the subjects are looking in the direction of the camera. Do not let the details go un-noticed. For example, a tangled necklace, a dirty face or shirt, hair in face, or awkward hand placement. First set up your posing and composition, and then look at each person individually just before you take the shot…but try to do this quickly! Do not waste time getting too creative when you photograph large groups. Unfortunately, with large groups attention spans dwindle if you are not prepared with a quick pose in mind. With my huge family the objective is is simply to get a shot where everyone is seen, has a decent expression, and looking in the direction of the camera! Save your more creative shots for the smaller groupings. – Put taller people towards the back and in the center, shorter people in front and on sides, if you are doing a standing pose. – Try not to make the group too deep. This will keep all faces in focus. – Chins up slightly for no double chins. – Have adults hold wiggly toddlers and babies. – If you can, shoot from above your group (i.e. with a ladder or chair) to make all the faces more visible. Do not shoot under tree branches or near large objects that will cast shadows or scattered light on skin or clothing. The goal is to find soft, even light. When in open shade, turn your group toward the sun (if you have that luxury in your location) to help get more light/detail in faces. Ok, that sums it up. Please feel free to add any others that I forgot in the comments section! I’ll leave you with a shot that will keep you smiling. 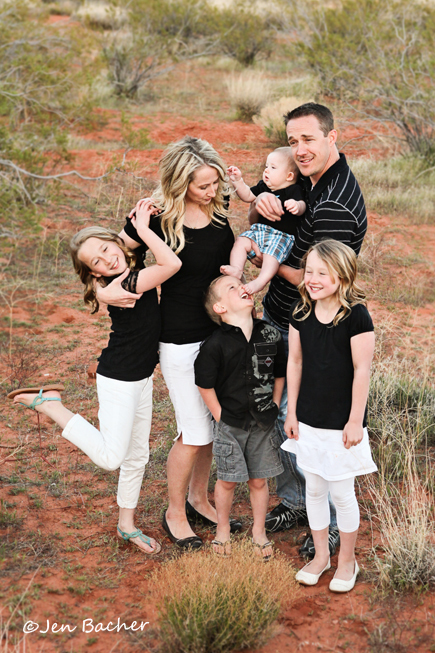 It was the best out-take of the day…of me and my kiddos and hubby. This is what happens when we attempt family pictures! Everyone goes crazy and suddenly becomes silly and uncooperative. I love the baby toes in my son’s nose, my husbands face, and me getting all P-O-ed! Better luck next time…ha ha! 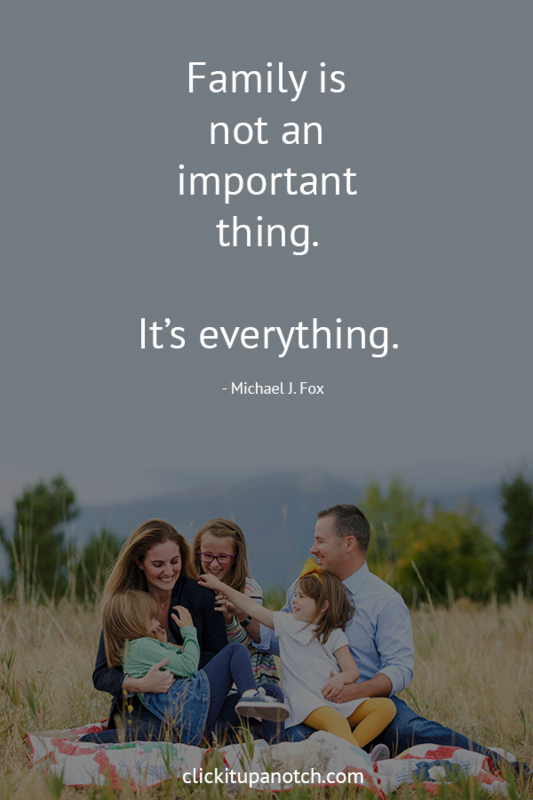 For many of us that is why we got into photography and what pushes us to continue to learn to capture not only our family but those around us. What a gift you are able to give to families!